There will be an estate sale at the Chestnut Hill home of former Philadelphia Mayor Frank Rizzo on Nov. 23, 2018. This photo shows a portrait of Rizzo, furniture and other decorations that will be among the items for sale. 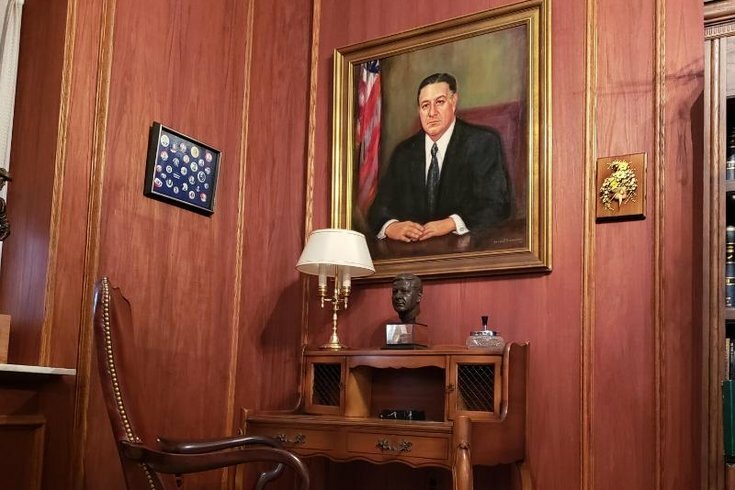 The home of controversial former Philadelphia mayor and police commissioner Frank Rizzo is for sale, and apparently so is everything inside it. The Inquirer first reported the three-day sale will begin on Black Friday and include famed items like Rizzo's Rolodex, his police baton, a few of his suits, and old photographs. You can see some of the items online, which were posted by the seller, Sales By Helen. From a quick glance, there is a lot of old, ornate, wooden furniture, lots of small figures, more figurines, and a seemingly endless set of porcelain and glass dining sets. Take a look for yourself. Rizzo's widow, Carmella, died at the age of 101 in August. Apparently remaining family members decided to sell the Chestnut Hill home, which was posted for sale about a month ago. The 7,398-square-foot spectacle is going for $1.695 million. The sale starts on Friday, Nov. 23 and will stay open from 10 a.m. to 2 p.m. It will open for the same hours on Saturday and Sunday.